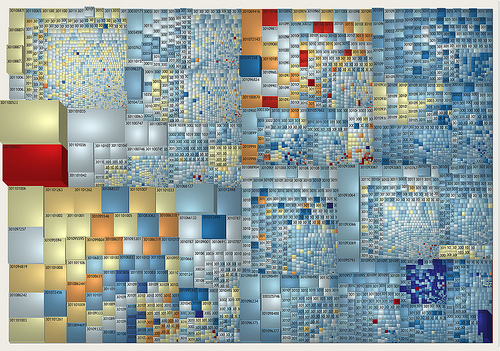 Looking for a good TreeMap visualization tool? You've just found the most powerful. TreeMap provides an easy, yet extremely powerful means of creating beautiful treemaps for analytical and presentation purpose. Importing data from a wide variety of file formats (including of course Excel), as well as connecting to databases (such as MySQL and SQL Server) is a breeze... and it scales to big data. The visual appearance of a treemap is highly configurable. Size, color, height, and labels can be mapped to any attribute. Many options allow you to further fine-tune the display. Coloring schemes can be adjusted to the last detail and the resulting treemaps can be rendered flat, or with a pseudo-3D cushion look with customizable light source. Treemaps works by dividing the display surface so that the area of each entry is proportional to the data values. In addition to the classic treemap layout algorithm, TreeMap also features a number of alternative layouts such as a squarified variant that harmonizes aspect ratios of the rectangles, or the aesthetically pleasing circular, tag cloud, and Voronoi layouts. In terms of interaction, TreeMap provides a zooming interface as well as the possibility to drill-down. Details on demand are available in the form of pop-ups whose content can be freely customized. Search and filtering possibilities allow to efficiently spot your data, and tightly linked TreePlot and TreeTable views complement the analytic process. Macrofocus TreeMap aims at democratizing interactive visualization and is priced fairly at US$ 199 per user with volume discount available. Take no risk by receiving a free 30-days evaluation license. TreeMap works on Windows, Mac, and Linux... and results can be shared over the web with other users using TreeMap Server. An API / Software Development Kit (SDK) is also available to allow the embedding of interactive treemaps in your web or Java application.